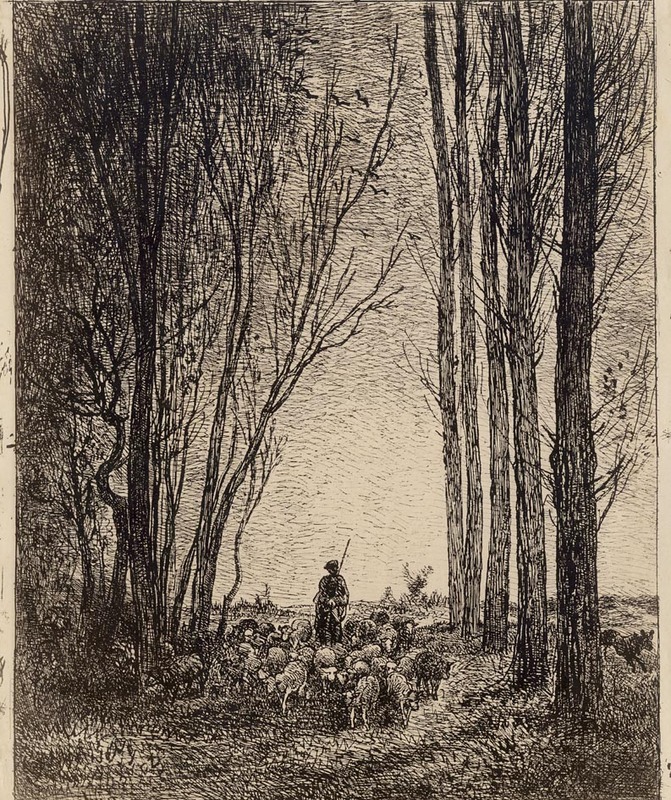 “La Rentrée du Troupeau” (The Return of the Herd), 1862, from the series, “Quarante Cliché-Glaces”, published in the Le Garrec 1921 edition with Edmond Sagot’s ink-stamp verso. 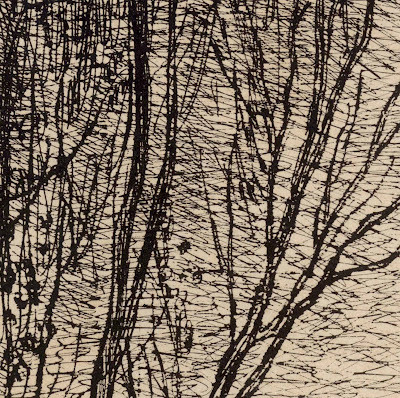 Cliché-verre on tan wove paper, signed on plate (in reverse at the lower-left edge). Verso numbered 142/150 with the stamp of Sagot. Condition: faultless impression in pristine condition. There are remnants of mounting hinges and Edmond Sagot's verification stamp of authenticity and the edition number “142/150” hand-inscribed in pencil above the stamp (verso). I am selling this large and historically important print by one of the leading artists of the Barbizon School for AU$1250 in total (currently US$964.63/EUR910.12/GBP768.50 at the time of posting this listing) including postage and handling to anywhere in the world. 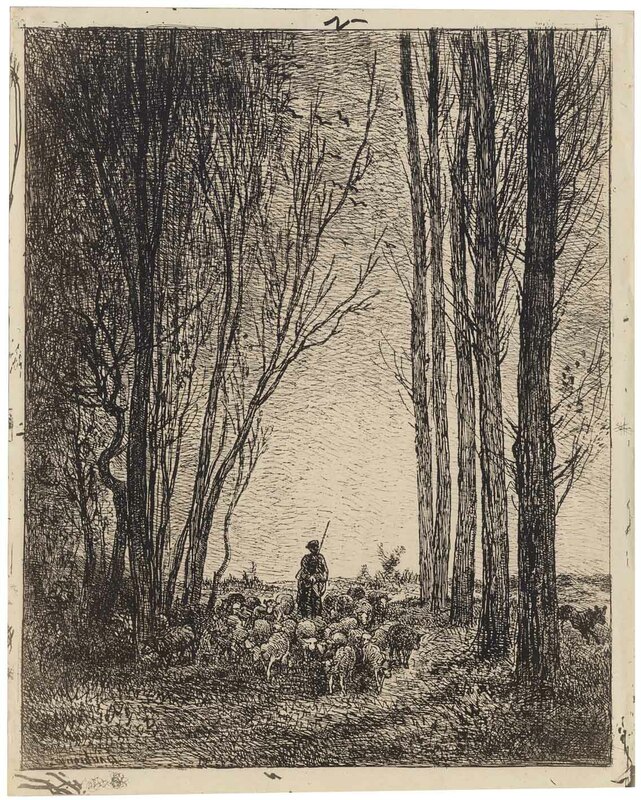 If you are interested in purchasing this sublime print capturing the spirit of the Barbizon School, please contact me (oz_jim@printsandprinciples.com) and I will send you a PayPal invoice to make the payment easy. 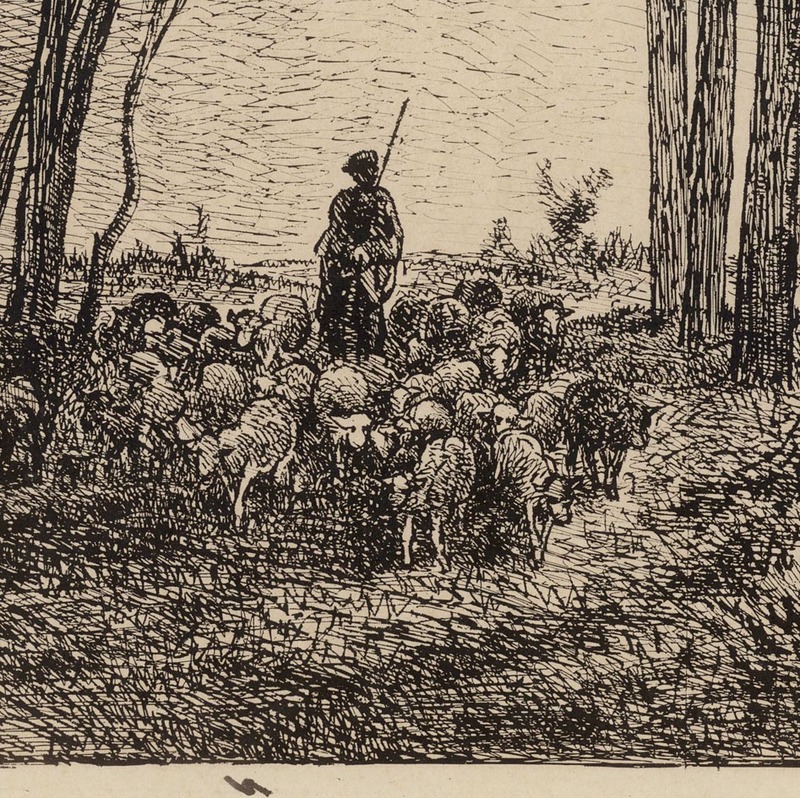 Art writers in the late nineteenth century didn’t quite know how to categorise Daubigny’s work. 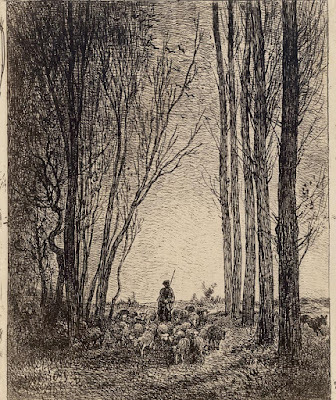 For instance, Charles Perrier (1859) went too far by proposing that Daubigny’s “ originality consists of fixing on canvas images that seem to have freed themselves from a mirror” (“Le Salon de 1859” in “Revue Contemporaine”, vol. 9, no. 2, May/June 1859, p. 320). 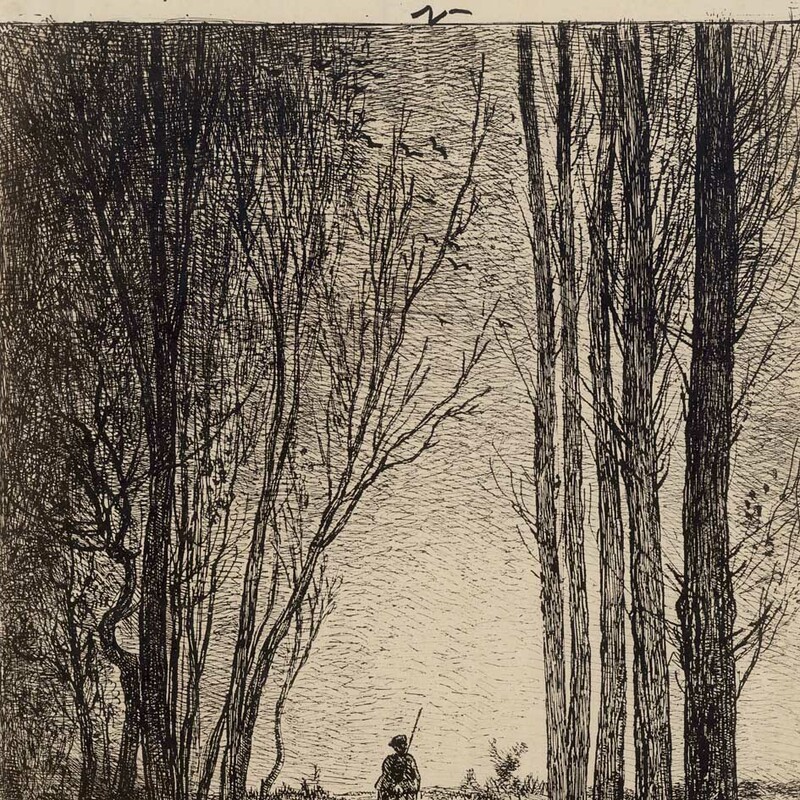 The poet Charles Baudelaire, whose portrait is purported to feature in my previous post (with personal concerns about this claim as I discuss in that post), was arguably closer to the mark with his assessment that Daubigny’s landscapes ”immediately convey to the soul of the viewer the original feeling with which they are filled” (“Salon de 1959”, p. 105). 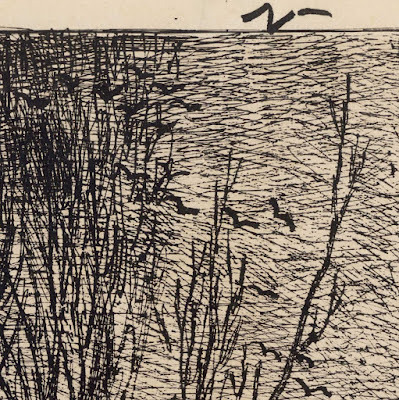 Even closer to finding the “right” classification for Daubigny Zacharie Astruc who (according to Lynne Ambrosini , in the excellent catalogue “Inspiring Impressionism: Daubigny, Monet, Van Gogh”) perceived that “Daubigny was strong in both ‘eyes’ and ‘heart” (p. 26)—a fine balance of objectivity and subjectivity. If I may take a very different way of looking at this print (shamelessly reconfiguring borrowed ideas from Ambrosini [op. cit, p. 25]), five years before executing this print, Daubigny spent a good deal of his art-making time working in his famous studio boat, “Botin.” This may at first seem like a trivial detail but it really isn’t as his view from the river changed the way that his compositions were arranged. 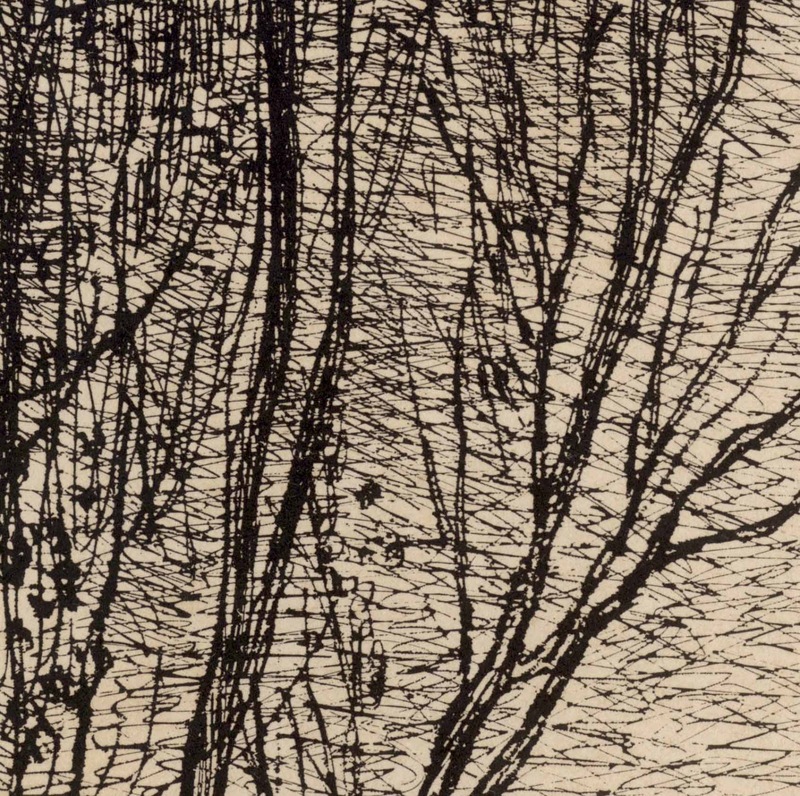 Essentially, from his boat he no longer looked at landscape with a foreground filled with an assortment of rocks, shrubs and grasses. Instead, he only saw ripples in water. 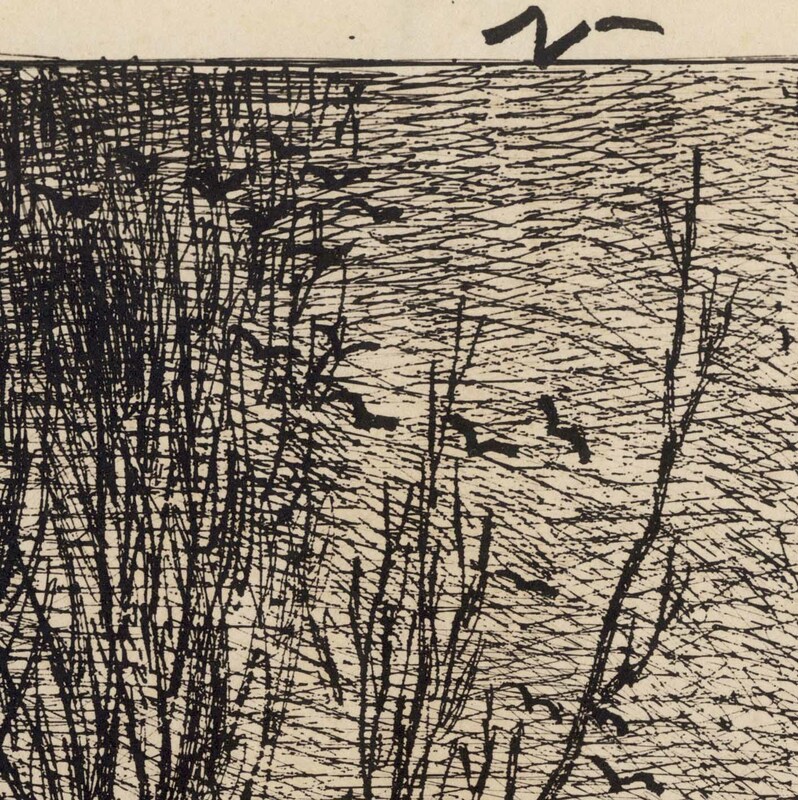 With regard to this print, I see a similar diminished interest in the immediate foreground and focus on the middle distance—a distance comparable to a long leap to shore from his little Botin. 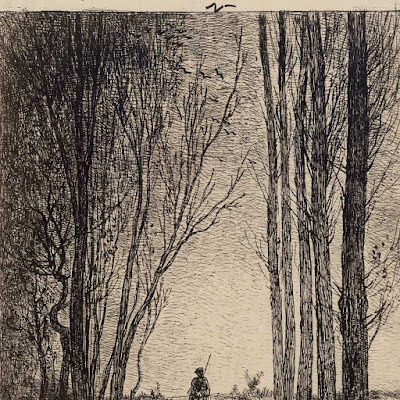 When this print is considered with an understanding of how Daubigny’s view of landscape had changed with his adventures upon his studio boat, I wish to propose that what is portrayed is more like a view through a screen of trees that one might see looking from a boat: a line-up of trees on the river bank with gaps in the visual barrier that they create allowing tiny glimpses into the distance. In short, although the portrayed scene is steeped in romanticism of the age in which it was created, it may also be an honest response to landscape evolved from the artist’s personal experiences.